It’s a little hard to put a link up in the distillery section for this one as there is not one comprehensive site for everything that is out there under Medley label. That being said, this is not the first time you’ve heard the family name. The Medley family has long been responsible for great bourbons such as Wathen’s and Old Medley. 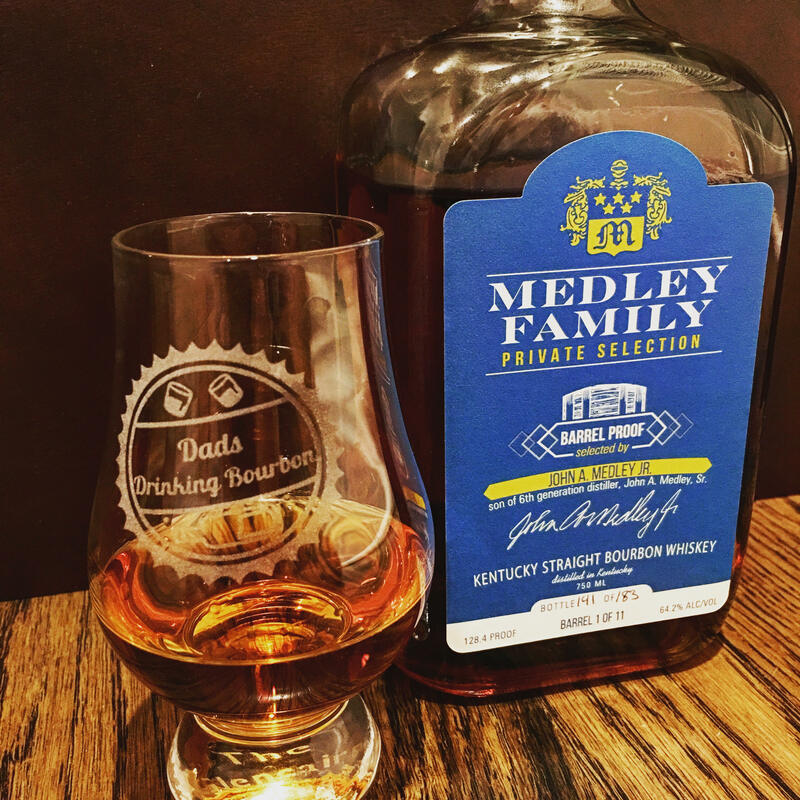 This release in particular, the Medley Family Private Selection, is something that the Dads Drinking Bourbon can really get behind. There is a much longer story that I could tell about how Charles Medley, who runs the Charles Medley Distillery Company with his son Sam, had lost ownership of the company only to later regain the rights to his name after another ownership change in between. It was during that time that they had sold the company, that they sourced and released Wathen’s, which is an homage to another member of the family. Sam, decided to create a release in honor of his father’s 75th birthday, and Medley Family Private Selection was born. The first three barrels were dispersed to the family. Same actually went through a lot to have his family select only the best bottles by sneaking around samples behind his father’s back! Luckily for us, the remaining barrels were released to the public but in a very small allocation. In fact, this was only released to a few select areas (Kentucky obviously having the highest allocation) including Nashville, where I was lucky to stumble upon a couple of bottles in a store. In total, only 268 cases were made, so only 1,608 bottles of this special release can be found! My bottle was #141 out of the 183 bottles available from Barrel #1. It’s important to note that this is a barrel proof bourbon, coming in at a toasty, but not overpowering, 128.4 proof. On to what you all really came here for… I was lucky enough to review this bourbon with Zeke. Sometimes on Sunday nights, after we put our respective kids to bed, you may find us lurking at the DDB Dad Cave and chatting on Instagram Live. Shameless plug: make sure you follow us on Instagram! Zeke’s thoughts on this one was that although he had a slightly thin feeling, he felt burn on the back end and his saliva turned into a gob. He felt a lot of heat, and a slight oil feeling, but ultimately thought that this was better than the 12 year. Overall, he felt that this was a quality product. I, on the other hand, was quite pleasantly surprised by this blue bottle. There wasn’t much on the nose for me with the exception of the heat of the proof and some spice. I was absolutely expecting this one to be a hot one. For being a barrel proof, this one was amazingly smooth while it burned. Your mouth experiences a wave of smoothness while at the same time your tongue tingles with numbness as your chest burns. Then there’s the only thing I can describe as a peanut butter and vanilla bomb which lingers after the burn. The most interesting thing about this one was how much it changed from sip to sip. Each moment this one sat out the air brought a similar but different experience with burn, smoothness, and taste. The peanut butter taste remained on the finish no matter what, and I can get behind that. Overall Rating: No matter what, you must Sip It.We realize that $80-$100 can be a lot to spend for some people for bourbon but whatever you do, you should experience this once considering the low allocation and the amount of preparation that Sam put in to making this one happen for his dad. That’s something any Dad Drinking Bourbon can appreciate! However, if you are lucky enough, you should Hunt It for sure. The allocation only puts this one in Kentucky, Chicago, New York, Nashville, California, North Carolina, and Washington D.C., so if you’re in one of those areas, I’d be on the lookout so you can pick one up for yourself.